The 3.5-inch, 3TB drive achieves its capacity boost without increasing areal density. It has five platters, each with 600GB -- that's one platter more than current 2TB drives. 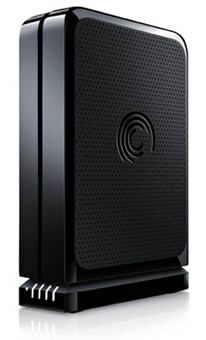 For those who like keeping track of such things, Seagate says this drive can store 120 high-definition movies, or 1,500 video games, thousands of photos or "countless" hours of digital music. The new drive comes pre-loaded with automatic backup software as well as encryption programs to keep all your data nice and safe. Seagate is selling the 3TB FreeAgent GoFlex Desk today for $250 through its online store. Cables to add new interfaces vary from $20 to $50. The company is also readying an internal 3TB hard drive for release later this year.